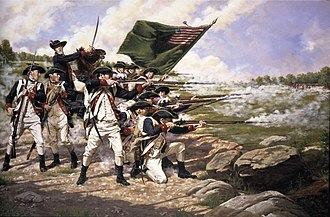 For the battle that took place in Trenton, New Jersey on January 2, 1777, see Battle of the Assunpink Creek. 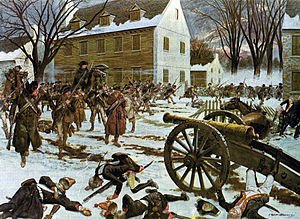 The Battle of Trenton was a small but pivotal battle during the American Revolutionary War which took place on the morning of December 26, 1776, in Trenton, New Jersey. 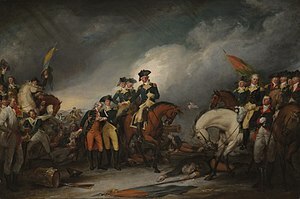 After General George Washington's crossing of the Delaware River north of Trenton the previous night, Washington led the main body of the Continental Army against Hessian mercenaries garrisoned at Trenton. After a brief battle, almost two-thirds of the Hessian force was captured, with negligible losses to the Americans. The battle significantly boosted the Continental Army's flagging morale, and inspired re-enlistments. The Continental Army had previously suffered several defeats in New York and had been forced to retreat through New Jersey to Pennsylvania. Morale in the army was low; to end the year on a positive note, George Washington—Commander-in-Chief of the Continental Army—devised a plan to cross the Delaware River on the night of December 25–26 and surround the Hessian garrison. Because the river was icy and the weather severe, the crossing proved dangerous. Two detachments were unable to cross the river, leaving Washington with only 2,400 men under his command in the assault, 3,000 less than planned. The army marched 9 miles (14.5 km) south to Trenton. The Hessians had lowered their guard, thinking they were safe from the American army, and had no long-distance outposts or patrols. Washington's forces caught them off guard and, after a short but fierce resistance, most of the Hessians surrendered and were captured, with just over a third escaping across Assunpink Creek. In early December 1776, American morale was very low. The Americans had been ousted from New York by the British and their Hessian auxiliaries, and the Continental Army was forced to retreat across New Jersey. Ninety percent of the Continental Army soldiers who had served at Long Island were gone. 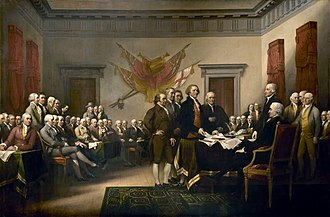 Men had deserted, feeling that the cause for independence was lost. Washington, Commander-in-Chief of the Continental Army, expressed some doubts, writing to his cousin in Virginia, "I think the game is pretty near up." At the time a small town in New Jersey, Trenton, was occupied by four regiments of Hessian soldiers (numbering about 1,400 men) commanded by Colonel Johann Rall. 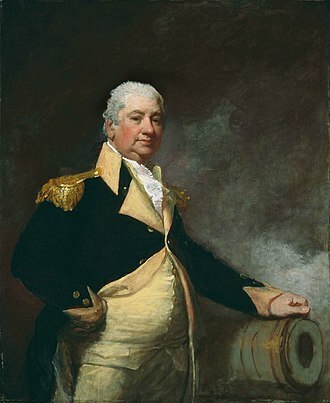 Washington's force comprised 2,400 men, with infantry divisions commanded by Major Generals Nathanael Greene and John Sullivan, and artillery under the direction of Brigadier General Henry Knox. George Washington had stationed a spy named John Honeyman, posing as a Tory, in Trenton. Honeyman had served with Major General James Wolfe in Quebec at the Battle of the Plains of Abraham on September 13, 1759, and had no trouble establishing his credentials as a Tory. Honeyman was a butcher and bartender, who traded with the British and Hessians. This enabled him to gather intelligence, and also to convince the Hessians that the Continental Army was in such a low state of morale that they would not attack Trenton. Shortly before Christmas, he arranged to be captured by the Continental Army, who had orders to bring him to Washington unharmed. After being questioned by Washington, he was imprisoned in a hut, to be tried as a Tory in the morning, but a small fire broke out nearby, enabling him to "escape." The American plan relied on launching coordinated attacks from three directions. General John Cadwalader would launch a diversionary attack against the British garrison at Bordentown, New Jersey, to block off reinforcements from the south. General James Ewing would take 700 militia across the river at Trenton Ferry, seize the bridge over the Assunpink Creek and prevent enemy troops from escaping. The main assault force of 2,400 men would cross the river 9 mi (14 km) north of Trenton and split into two groups, one under Greene and one under Sullivan, to launch a pre-dawn attack. Sullivan would attack the town from the south, and Greene from the north. Depending on the success of the operation, the Americans would possibly follow up with separate attacks on Princeton and New Brunswick. During the week before the battle, American advance parties began to ambush enemy cavalry patrols, capturing dispatch riders and attacking Hessian pickets. The Hessian commander, to emphasize the danger to his men, sent 100 infantry and an artillery detachment to deliver a letter to the British commander at Princeton. 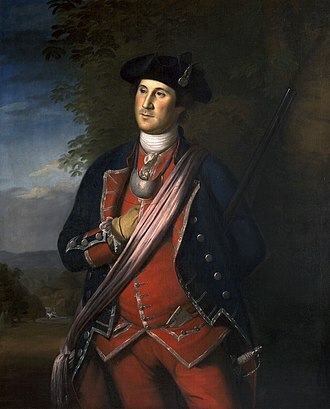 Washington ordered Ewing and his Pennsylvania militia to try to gain information on Hessian movements and technology. 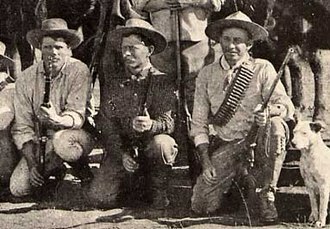 Ewing instead made three successful raids across the river. On December 17 and 18, 1776, they attacked an outpost of jägers and on the 21st, they set fire to several houses. Washington put constant watches on all possible crossings near the Continental Army encampment on the Delaware, as he believed William Howe would launch an attack from the north on Philadelphia if the river froze over. On December 20, 1776, some 2,000 troops led by General Sullivan arrived in Washington's camp. They had been under the command of Charles Lee, and had been moving slowly through northern New Jersey when Lee was captured. That same day, an additional 800 troops arrived from Fort Ticonderoga under the command of Horatio Gates. On December 14, 1776, the Hessians arrived in Trenton to establish their winter quarters. At the time, Trenton was a small town with about 100 houses and two main streets, King (now Warren) Street and Queen (now Broad) Street. Carl von Donop, Rall's superior, had marched south to Mount Holly on December 22 to deal with the resistance in New Jersey, and had clashed with some New Jersey militia there on December 23. 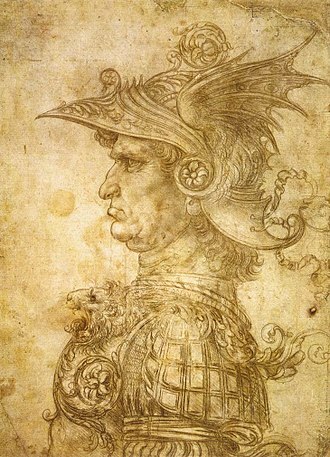 Donop, who despised Rall, was reluctant to give command of Trenton to him. Rall was known to be loud and unacquainted with the English language, but he was also a 36-year soldier with a great deal of battle experience. His request for reinforcements had been turned down by British commander General James Grant, who disdained the American rebels and thought them poor soldiers. Despite Rall's experience, the Hessians at Trenton did not admire their commander. They believed that he was too nice, and not ruthless enough to be successful. His officers complained, "His love of life was too great, a thought came to him, then another, so he could not settle on a firm decision ..." Rall avoided hard work and had little concern for his troops' comfort. Before Washington and his troops left, Benjamin Rush came to cheer up the General. While he was there, he saw a note Washington had written, saying, "Victory or Death". Those words would be the password for the surprise attack. Each soldier carried 60 rounds of ammunition, and three days of rations. When the army arrived at the shores of the Delaware, they were already behind schedule, and clouds began to form above them. It began to rain. As the air's temperature dropped, the rain changed to sleet, and then to snow. The Americans began to cross the river, with John Glover in command. The men went across in Durham boats, while the horses and artillery went across on large ferries. The 14th Continental Regiment of Glover manned the boats. During the crossing, several men fell overboard, including Colonel John Haslet. Haslet was quickly pulled out of the water. No one died during the crossing, and all the artillery pieces made it over in good condition. The terrible weather conditions delayed the landings in New Jersey until 3:00 am; the plan was that they were supposed to be completed by 12:00 am. Washington realized it would be impossible to launch a pre-dawn attack. Another setback occurred for the Americans, as generals Cadwalader and Ewing were unable to join the attack due to the weather conditions. At 4:00 am, the soldiers began to march towards Trenton. Along the way, several civilians joined as volunteers, and led as guides (see Captain John Mott) because of their knowledge of the terrain. After marching 1.5 miles (2.4 km) through winding roads into the wind, they reached Bear Tavern, where they turned right. The ground was slippery, but it was level, making it easier for the horses and artillery. They began to make better time. They soon reached Jacobs Creek, where, with difficulty, the Americans made it across. The two groups stayed together until they reached Birmingham, where they split apart. 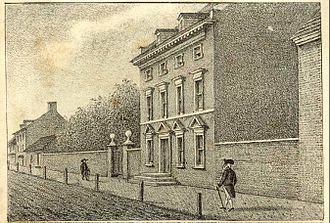 Soon after, they reached the house of Benjamin Moore, where the family offered food and drink to Washington. At this point, the first signs of daylight began to appear. Many of the troops did not have boots, so they were forced to wear rags around their feet. Some of the men's feet bled, turning the snow to a dark red. Two men died on the trip. About 2 miles (3 km) outside the town, the main columns reunited with the advance parties. They were startled by the sudden appearance of 50 armed men, but they were American. Led by Adam Stephen, they had not known about the plan to attack Trenton, and had attacked a Hessian outpost. Washington feared the Hessians would have been put on guard, and shouted at Stephen, "You sir! You Sir, may have ruined all my plans by having them put on their guard." Despite this, Washington ordered the advance continue to Trenton. 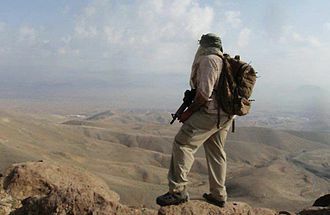 In the event, Rall thought the first raid was the attack which Grant had warned him about, and that there would be no further action that day. At 8 am, the outpost was set up by the Hessians at a cooper shop on Pennington Road about one mile north-west of Trenton. 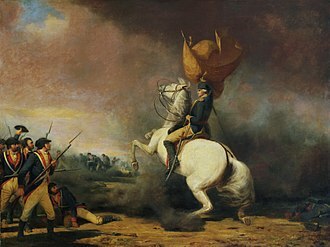 Washington led the assault, riding in front of his soldiers. As the Hessian commander of the outpost, Lieutenant Andreas Wiederholdt, left the shop, an American fired at him but missed. Wiederholdt shouted, "Der Feind!" (The Enemy!) and other Hessians came out. The Americans fired three volleys and the Hessians returned one of their own. Washington ordered Edward Hand's Pennsylvania Riflemen and a battalion of German-speaking infantry to block the road that led to Princeton. They attacked the Hessian outpost there. Wiederholdt soon realized that this was more than a raiding party; seeing other Hessians retreating from the outpost, he led his men to do the same. Both Hessian detachments made organized retreats, firing as they fell back. On the high ground at the north end of Trenton, they were joined by a duty company from the Lossberg Regiment. They engaged the Americans, retreating slowly, keeping up continuous fire and using houses for cover. Once in Trenton, they gained covering fire from other Hessian guard companies on the outskirts of the town. Another guard company nearer to the Delaware River rushed east to their aid, leaving open the River Road into Trenton. 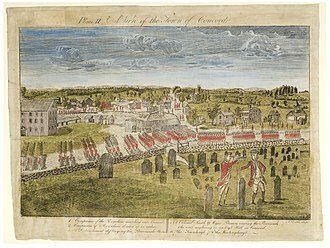 Washington ordered the escape route to Princeton be cut off, sending infantry in battle formation to block it, while artillery formed at the head of King and Queen streets. 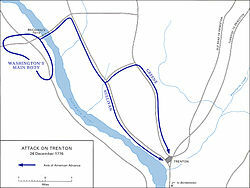 Leading the southern American column, General Sullivan entered Trenton by the abandoned river road and blocked the only crossing over the Assunpink Creek to cut off the Hessian escape. Sullivan briefly held up his advance to make sure Greene's division had time to drive the Hessians from their outposts in the north. Soon after, they continued their advance, attacking the Hermitage, home of Philemon Dickinson, where 50 Jägers under the command of Lieutenant von Grothausen were stationed. Lieutenant von Grothausen brought 12 of his Jägers into action against the advanced guard, but had only advanced a few hundred yards when he saw a column of Americans advancing to the Hermitage. Pulling back to the Hessian barracks, he was joined by the rest of the Jägers. After the exchange of one volley, they turned and ran, some trying to swim across the creek, while others escaped over the bridge, which had not yet been cut off. The 20 British Dragoons also fled. As Greene and Sullivan's columns pushed into the town, Washington moved to high ground north of King and Queens streets to see the action and direct his troops. By this time, American artillery from the other side of the Delaware River had come into action, devastating the Hessian positions. With the sounding of the alarm, the three Hessian regiments began to prepare for battle. The Rall regiment formed on lower King Street along with the Lossberg Regiment, while the Knyphausen Regiment formed at the lower end of Queen Street. Lieutenant Piel, Rall's brigade adjutant, woke his commander, who found that the rebels had taken the "V" of the main streets of the town. This is where the engineers had recommended building a redoubt. Rall ordered his regiment to form up at the lower end of King Street, the Lossberg regiment to prepare for an advance up Queen Street, and the Knyphausen regiment to stand by as a reserve for Rall's advance up King Street. The American cannon stationed at the head of the two main streets soon came into action. In reply, Rall directed his regiment, supported by a few companies of the Lossberg regiment, to clear the guns. The Hessians formed ranks and began to advance up the street, but their formations were quickly broken by the American guns and fire from Mercer's men who had taken houses on the left side of the street. Breaking ranks, the Hessians fled. Rall ordered two three-pound cannon into action. After getting off six rounds each, within just a few minutes, half of the Hessians manning their guns were killed by the American cannon. After the men fled to cover behind houses and fences, their cannons were taken by the Americans. Following capture of the cannon, men under the command of George Weedon advanced down King Street. On Queen Street, all Hessian attempts to advance up the street were repulsed by guns under the command of Thomas Forrest. After firing four rounds each, two more Hessian guns were silenced. One of Forrest's Howitzers was put out of action with a broken axle. The Knyphausen Regiment became separated from the Lossberg and the Rall regiments. The Lossberg and the Rall fell back to a field outside town, taking heavy losses from grapeshot and musket fire. In the southern part of the town, Americans under command of Sullivan began to overwhelm the Hessians. John Stark led a bayonet charge at the Knyphausen regiment, whose resistance broke because their weapons would not fire. Sullivan led a column of men to block off escape of troops across the creek. The Hessian forces lost 22 killed in action, 83 wounded, and 896 captured–including the wounded. The Americans suffered only two deaths from bare feet causing frostbite and five wounded from battle, including a near-fatal shoulder wound to future president James Monroe. Other losses incurred by the Patriots due to exhaustion, exposure, and illness in the following days may have raised their losses above those of the Hessians. Among those captured by the Patriots was Christian Strenge, later to become a schoolmaster and fraktur artist in Pennsylvania. An officer in Washington's staff wrote before the battle, "They make a great deal of Christmas in Germany, and no doubt the Hessians will drink a great deal of beer and have a dance to-night. They will be sleepy to-morrow morning." Popular history commonly portrays the Hessians as drunk from Christmas celebrations. However, historian David Hackett Fischer quotes Patriot John Greenwood, who fought in the battle and supervised Hessians afterward, who wrote, "I am certain not a drop of liquor was drunk during the whole night, nor, as I could see, even a piece of bread eaten." Military historian Edward G. Lengel wrote, "The Germans were dazed and tired but there is no truth to the legend claiming that they were helplessly drunk." This small but decisive battle, as with the later Battle of Cowpens, had an effect disproportionate to its size. 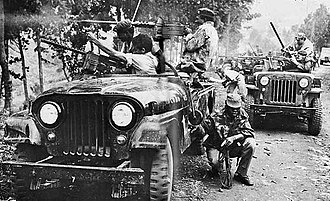 The colonial effort was galvanized, and the Americans overturned the psychological dominance achieved by the British Government troops in the previous months. Howe was stunned that the Patriots so easily surprised and overwhelmed the Hessian garrison. 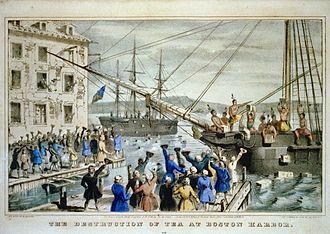 Colonial support for the rebellion was also buoyed significantly at this time by writings of Thomas Paine and additional successful actions by the New Jersey Militia. By noon, Washington's force had moved across the Delaware back into Pennsylvania, taking their prisoners and captured supplies with them. This battle gave the Continental Congress a new confidence, as it proved colonial forces could defeat regulars. It also increased re-enlistments in the Continental Army forces. By defeating a European army, the colonials reduced the fear which the Hessians had caused earlier that year after the fighting in New York. Two notable American officers were wounded: William Washington, cousin of the General, and Lieutenant James Monroe, the future President of the United States. Monroe was carried from the field bleeding badly after he was struck in the left shoulder by a musket ball, which severed an artery. Doctor John Riker clamped the artery, preventing him from bleeding to death. 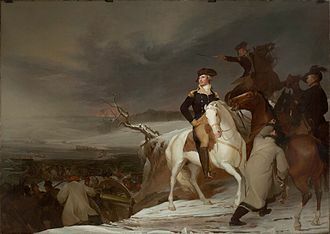 The hours before the battle served as the inspiration for the painting Washington Crossing the Delaware by German American artist Emanuel Leutze. 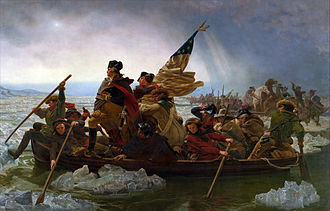 The image in the painting, in which Washington stands majestic in his boat as it crosses the Delaware River, is generally believed to be more symbolic than historically accurate. The waters of the river were icy and treacherous, and the flag Monroe holds was not created until six months after the battle. In addition, contrary to the painting, the crossing occurred before dawn. On the other hand, Fischer argues that because the crossing took place in a storm, people may have stood to avoid sitting in icy water in the boats. Because of its emotional content, the painting has become an icon of American history. The Trenton Battle Monument, erected at "Five Points" in Trenton, stands as a tribute to this American victory. The crossing of the Delaware and battle are reenacted by local enthusiasts every year (unless the weather is too severe on the river). Eight current Army National Guard units (101st Eng Bn, 103rd Eng Bn, A/1-104th Cav, 111th Inf, 125th QM Co, 175th Inf, 181st Inf and 198th Sig Bn) and one currently-active Regular Army Artillery battalion (1–5th FA ) are derived from American units that participated in the Battle of Trenton. There are thirty current units of the U.S. Army with colonial roots. ^ Kevin Wright. "The Crossing And Battle At Trenton – 1776". Bergen County Historical Society. Retrieved August 14, 2008. ^ Brooklyn United. "Johann Christian Strenge - Self-Taught Genius". selftaughtgenius.org. Retrieved Apr 6, 2019. ^ a b c d "What's wrong with this painting?". Washington Crossing Historic Park. Retrieved August 14, 2008. Ferling, John (2007). Almost a Miracle. Oxford University Press. ISBN 0-19-518121-2. Fischer, David Hackett (2006). Washington's Crossing. Oxford University Press. ISBN 0-19-517034-2. Mitchell, Craig (2003). George Washington's New Jersey. Middle Atlantic Press. ISBN 0-9705804-1-X. Savas, Theodore (2003). Guide to the Battles of the American Revolution. Savas Beatie. ISBN 1-932714-12-X. Scheer, George (1987). Rebels and Redcoats. Da Capo Press. ISBN 0-306-80307-0. Wiederholdt, Andreas (2015) . M.D. Learned; C. Grosse, eds. Tagebuch des Capt. Wiederholdt vom 7 Oktober bis 7 December 1780. The University of Michigan Library: The MacMillan Co, New York. Wood, W.J. Henry (2003). Battles of the Revolutionary War. Da Capo Press. ISBN 0-306-81329-7. Wikimedia Commons has media related to Battle of Trenton. "The Two Battles of Trenton". The Trenton Historical Society. "The Winter Patriots: The Trenton-Princeton Campaign of 1776–1777". George Washington's Mount Vernon. The Battle of the Plains of Abraham, known as the Battle of Quebec, was a pivotal battle in the Seven Years War. The culmination of a siege by the British, the battle lasted about 15 minutes. In the wake of the battle, the French evacuated the city, their military force in Canada. 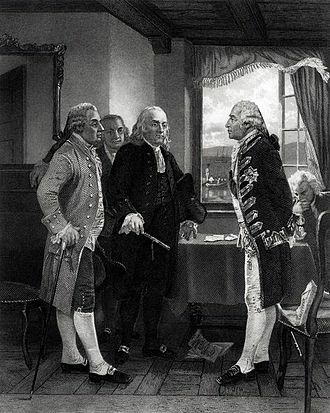 France ceded most of its possessions in eastern North America to Great Britain in the Treaty of Paris, the decisive success of the British forces and the subsequent capture of Quebec City formed part of what became known as the Annus Mirabilis in Great Britain. 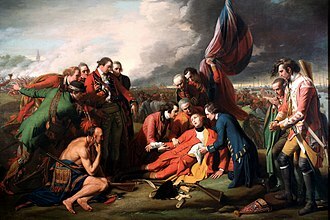 As the Seven Years War entered its stages through 1758 and 1759, in 1758 after defeat in July at the Battle of Carillon, the British took Louisbourg in August, causing Atlantic Canada to fall into British hands, and opening the sea route to attack Quebec. Fort Frontenac fell to the British in the month, costing the French supplies for the Ohio Valley campaign. When some of the Indian supporters of the French made peace with the British, French leadership, specifically Governor de Vaudreuil and General Montcalm, were unsettled by the British successes. However, Quebec was still able to protect itself as the British prepared an attack for 1759. James Wolfe expected to lead 12,000 men, but was greeted by only approximately 7,000 regular troops,400 officers, Wolfes troops were supported by a fleet of 49 ships and 140 smaller craft led by Admiral Charles Saunders. In preparation for the approach to Quebec, James Cook surveyed a large portion of the river. 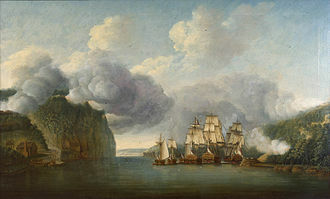 Cooks ship was one of the first ships up the river, sounding the channel and guiding the fleet as it moved up, eventually landing Wolfe and his men on the Île dOrléans on 28 June. 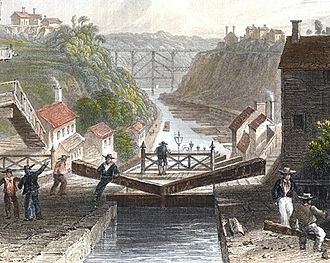 Despite an air of defeatism among the leadership, the professional French troops, prior to the arrival of the British, a small fleet of supply ships had arrived in Quebec with much needed supplies. 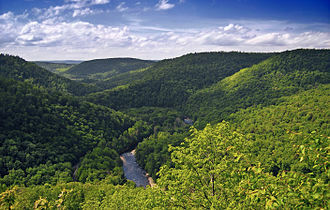 Those supplies, along with 500 reinforcements, were likely behind the lengthened siege, in addition, a screen of trees along the Montmorency River made an approach on that route dangerous. 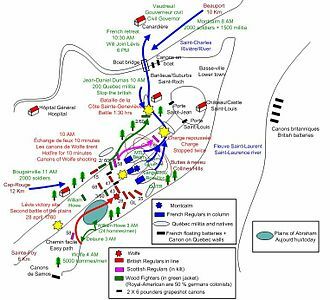 On 31 July, the first serious attempt by Wolfes troops to land on the northern shore led to the Battle of Beauport, approximately 3,500 troops, supported by a heavy bombardment, attempted to land, but were caught under fire in the river shallows. John Cadwalader was a commander of Pennsylvania troops during the American Revolutionary War. John Cadwalader was born in Trenton, New Jersey of Quaker parentage, in 1750, the Cadwalader family removed to Philadelphia where John and Lambert Cadwalader, his brother, were merchants. On September 25,1768, John Cadwalader married Elizabeth Lloyd and her brother, Edward Lloyd IV, was a delegate to the Continental Congress for Maryland. Their daughter, Maria Cadwalader, married Samuel Ringgold, who became a congressman representing Maryland, two of their sons, Samuel Ringgold and Cadwalader Ringgold, had distinguished military careers. In 1776, Colonel John Cadwalader was elected senior officer of the Philadelphia Associators, Cadwalader had received orders to send his column across the river on the night of December 25–26 and march to Trenton from the south. Meanwhile, George Washingtons column would cross the river to the north of Trenton, after successfully crossing his light forces, Cadwalader discovered that river ice prevented crossing his artillery. He returned his column to the Pennsylvania side, leaving Washingtons forces unsupported in New Jersey, Washington was successful in his surprise attack on the morning of December 26 against the Hessian garrison in Trenton. Cadwalader and his column did cross the river the next day, after the Conway Cabal, he fought a duel with Thomas Conway in 1778 in which Cadwalader wounded his opponent with a shot in the mouth. Supposedly Cadawalader, a supporter of Washington throughout the cabal, John Cadwalader married Williamina Bond, daughter of Dr. Phineas Bond, of Philadelphia and niece of Thomas Bond. Their son, like his father, became a general of the Pennsylvania militia and their daughter, married David Erskine, 2nd Baron Erskine, who was the British Ambassador to the United States from 1807 to 1809. In 1779, Cadwalader became a trustee of the University of Pennsylvania and returned to his estate on the banks of the Sassafras River at Shrewsbury, Kent County and he became a member of the Maryland State Assembly. John Cadwalader died February 10,1786 and he is buried at Shrewsbury Chapel, Kent County, Maryland. Thomas Paine wrote his epitaph, His early and inflexible patriotism will endear his memory to all true friends of the American Revolution and it may with strictest justice be said of him, that he possessed a heart incapable of deceiving. His manners were formed on the nicest sense of honor and the tenor of his life was governed by this principle. The companions of his youth were the companions of his manhood and he never lost a friend by insincerity nor made one by deception. His domestic virtues were truly exemplary and while they served to endear the remembrances they embitter the loss of him to all his numerous friends, surviving pieces are among the finest and best-documented Philadelphia Chippendale furniture ever made. Historical Society of Pennsylvania, Biography of John Cadwalader Fischer, David Hackett, ISBN 0-19-517034-2 Jordan, John W. Encyclopedia of Pennsylvania biography. New York, Lewis Historical Pub. Henry Knox was a military officer of the Continental Army and the United States Army, who served as the first United States Secretary of War from 1789 to 1794. Born and raised in Boston, Massachusetts, he owned and operated a bookstore there, cultivating an interest in military history and joining a local artillery company. 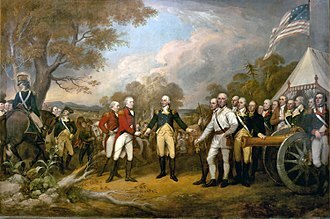 When the American Revolutionary War broke out in 1775, he befriended General George Washington, in this role he accompanied Washington on most of his campaigns, and had some involvement in many major actions of the war. He established training centers for artillerymen and manufacturing facilities for weaponry that were valuable assets to the fledgling nation, following the adoption of the United States Constitution, he became President Washingtons Secretary of War. In this role he oversaw the development of coastal fortifications, worked to improve the preparedness of local militia, Knoxs idealistic views on the subject were frustrated by ongoing illegal settlements and fraudulent land transfers involving Indian lands. He retired to what is now Thomaston, Maine, in 1795 and he died in 1806 from an infection he contracted after swallowing a chicken bone, leaving an estate that was bankrupt. Henry Knoxs parents and Mary, were of Scotch-Irish origin and his father was a ship builder who, due to financial reverses, left the family for St Eustatius in the West Indies where he died in 1762 of unknown causes. Henry was admitted to the Boston Latin School, where he studied Greek, arithmetic, since he was the oldest son still at home when his father died, he left school at the age of 12 and became a clerk in a bookstore to support his mother. The shops owner, Nicholas Bowes, became a father figure for the boy, allowing him to browse the shelves of the store. The inquisitive future war hero, when he was not running errands, taught himself French, learned some philosophy and advanced mathematics and he immersed himself in literature from a tender age. However, Knox was involved in Bostons street gangs, becoming one of the toughest fighters in his neighborhood, impressed by a military demonstration, at 18 he joined a local artillery company called The Train. After defeating the Hessians at the Battle of Trenton on the morning of December 26,1776, Washington withdrew back to Pennsylvania. He subsequently decided to attack the British forces before going into winter quarters, on December 29, he led his army back into Trenton. On the night of January 2,1777, Washington repulsed a British attack at the Battle of the Assunpink Creek and that night, he evacuated his position, circled around General Lord Cornwallis army, and went to attack the British garrison at Princeton. On January 3, Brigadier General Hugh Mercer of the Continental Army clashed with two regiments under the command of Lieutenant Colonel Charles Mawhood of the British Army and his troops were overrun, and Mercer was mortally wounded. Washington sent a brigade of militia under Brigadier General John Cadwalader to help them, the militia, on seeing the flight of Mercers men, began to flee. Washington rode up with reinforcements and rallied the fleeing militia and he led the attack on Mawhoods troops, driving them back. Mawhood gave the order to retreat and most of the tried to flee to Cornwallis in Trenton. In Princeton itself, Brigadier General John Sullivan encouraged some British troops who had taken refuge in Nassau Hall to surrender, after the battle, Washington moved his army to Morristown, and with their third defeat in 10 days, the British evacuated southern New Jersey. With the victory at Princeton, morale rose in the American ranks, the battle was the last major action of Washingtons winter New Jersey campaign. Part of the site of the battle is now Princeton Battlefield State Park, on the night of December 25–26,1776, General George Washington, Commander-in-chief of the Continental Army, led 2,400 men across the Delaware River. After a nine-mile march, they seized the town of Trenton on the morning of the 26th, killing or wounding over 100 Hessians, soon after capturing the town, Washington led the army back across the Delaware into Pennsylvania. On the 29th, Washington once again led the army across the river, on the 31st, Washington appealed to his men, whose enlistments expired at the end of the year, Stay for just six more weeks for an extra bounty of ten dollars. His appeal worked, and most of the men agreed to stay, that day, Washington learned that Congress had voted to give him wide-ranging powers for six months that are often described as dictatorial. In response to the loss at Trenton, General Lord Cornwallis left New York City and reassembled a British force of more than 9,000 at Princeton to oppose Washington. Leaving 1,200 men under the command of Lieutenant Colonel Charles Mawhood at Princeton, Washington sent troops to skirmish with the approaching British to delay their advance. It was almost nightfall by the time the British reached Trenton, after three failed attempts to cross the bridge over the Assunpink Creek, beyond which were the primary American defenses, Cornwallis called off the attack until the next day. During the night, Washington called a council of war and asked his officers whether they should stand and fight, attempt to cross the river somewhere, or take the backroads to attack Princeton. Although the idea had occurred to Washington, he learned from Arthur St. They took their name from the German state of Hesse-Kassel. 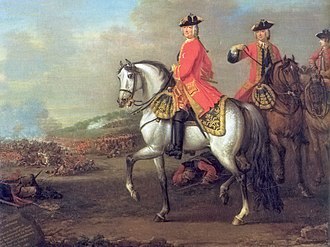 The British hired Hessian troops for duty in several eighteenth century conflicts. About 30,000 German soldiers fought for the British during the American Revolutionary War and they entered the British service as entire units, fighting under their own German flags, commanded by their usual officers, and wearing their existing uniforms. The largest contingent came from the state of Hesse, which supplied about 40% of the German troops who fought for the British. The large number of troops from Hesse-Kassel led to the use of the term Hessians to refer to all German troops fighting on the British side, the others were rented from other small German states. Patriots presented the soldiers as foreign mercenaries with no stake in America, many of the men were press-ganged into Hessian service. Deserters were summarily executed or beaten by an entire company, Hessian prisoners of war were put to work on local farms. The small German states of the Holy Roman Empire had professional armies, when military conflict broke out, the German states provided a ready supply of trained troops that was ready to go into action immediately. Hesse-Kassel was particularly prominent in this role, Between 1706 and 1707,10,000 Hessians served as a corps in Eugene of Savoys army in Italy before moving to the Spanish Netherlands in 1708. In 1714,6,000 Hessians were rented to Sweden for its war with Russia whilst 12,000 Hessians were hired by George I of Great Britain in 1715 to combat the Jacobite Rebellion. In the midst of the War of the Austrian Succession in 1744,6,000 Hessians were fighting with the British army in Flanders whilst another 6,000 were in the Bavarian army. By 1762,24,000 Hessians were serving with Ferdinand of Brunswicks army in Germany, in most of these wars, Hesse-Kassel never became a belligerent by declaring war on any other country. The troops were rented for service in other armies, and Hesse-Kassel itself had no stake in the outcome of the war. Thus, it was possible for Hessians to serve with the British and Bavarian armies in the War of the Austrian Succession, even though Britain, historian Charles Ingrao says that the local prince had turned Hesse into a mercenary state by renting out his regiments to fund his government. "Major General Wolfe. Who, at the Expence of his Life, purchas'd immortal Honour for his Country, and planted, with his own Hand, the British Laurel, in the inhospitable Wilds of North America, By the Reduction of Quebec, Septr. 13th. 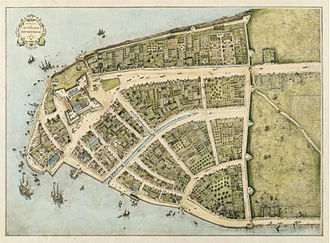 1759." 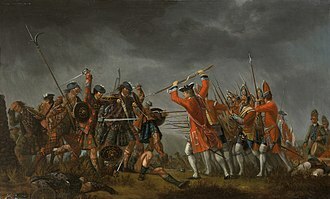 Wolfe served during the Jacobite rising of 1745, where he fought at the decisive Battle of Culloden.